Our mission is to recruit, educate and nurture women to build – and advocate for – simple, decent and affordable houses in their communities. Women Build is aimed at empowering women and eliminating the “intimidation factor” surrounding construction skills and home improvements. This initiative doesn’t exclude men, but it’s about including women and opening new windows of opportunity. 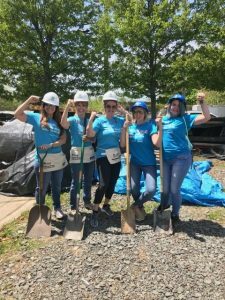 HFHMC invites women to volunteer during Women Build Week 2019. This is just one of our Women Build Warriors fundraising events where you’ll build, learn a new skill and help raise funds for our affiliate at the same time. Please register online (links below) – Cost is $25 pp, includes instruction, all tools, lunch and a t-shirt.